Finally - a tasty But Roast mix that is so easy to make by simply adding water and baking in the recyclable oven tray provided! 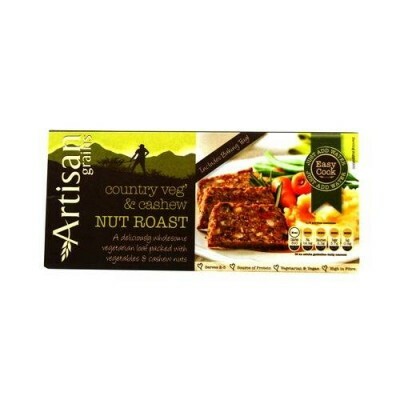 Artisan Grains Nut Roasts are packed with nuts and make an amazing vegetarian & vegan loaf which can be enjoyed by all - offering a great and healthier protein alternative for you. High in Fibre and a source of protein. 1. Pour contents of sachet into a bowl. All 200ml cold water. Mix and let sit for 5 mins. 2. Transfer mix into the baking tray provided. 3. Preheat the oven to 180 degrees Celsius (gas mark 4). bake for 35 to 40 mins until golden brown and cooked through. Allow to cool a little. Alice and serve as desired. Packed in a factory where nuts and sesame seeds are handled. Click the button below to add the Artisan Grains Country Veg & Cashew Nut Roast 200g to your wish list.